I've been out and about picking what's left of the blackberries this morning and I'm feeling all virtuous as a result. Don't worry if you don't fancy yourself as much of a forager, the supermarkets all sell them and you can cheat and use bags of frozen ones too. If you do use the frozen ones though then just allow them to completely defrost first as there is often a lot of water that comes out and you don't want it diluting your booze. If blackberries are a bit sparse on the bushes where you live then you can always use elderberries, which are abundant right now, to top them up with or I've been known to throw some fresh quartered figs in there too. I like to use golden rum for this and I add the vanilla pod to bring out the caramel flavours in the booze. Brandy works really well too if you prefer or if you are more of a whisky hound then a light whisky would also be fab. Put everything into a big Kilner style jar and mix well, make sure that the alcohol completely covers the fruit. Leave in a cool, dark place for at least 3 weeks, agitate it every now and then to mix and preferably leave it until Christmas, this will get better the longer you leave it. Taste after a couple of weeks and add more sugar if you think it needs it. Strain through a coffee filter to ensure a lovely clear booze then bottle it. Hazel, I think I just want you to feed me and pour boozes down me for a few days. I need to go and whisper sweet nothings to the blackberry bush in my garden to make sure we get enough off it to do this! It's their true calling in life, fight the birds for them! Ah - I do the same thing with brandy - it is excellent, but I rather fancy rum for next autumn, now. 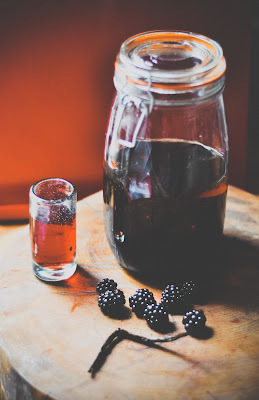 I made a fab blackcurrant brandy over the summer, didn't last long though! Exactly last year I also prepared blackberry jam at home but it also didn't last long. Any tips or suggestions? Hi I've made the blackberry and vanilla rum, just strained it, it looks and tastes great, any ideas on using the soaked blackberries? I want to make an autumnal eton mess , but I would need to keep this fruit until xmas...... dont want to freeze and kill the alchohl any suggestions on how to keep it until I need it. Thank you a fab recipe, strained and looking great. I was thinking of making a pavlova with the sumptuously soaked berries, but how can I keep them without them spoiling ? I don't want to make it until christmas. I would be very greatful for anyones thoughts? Please. And thankyuo in advance.